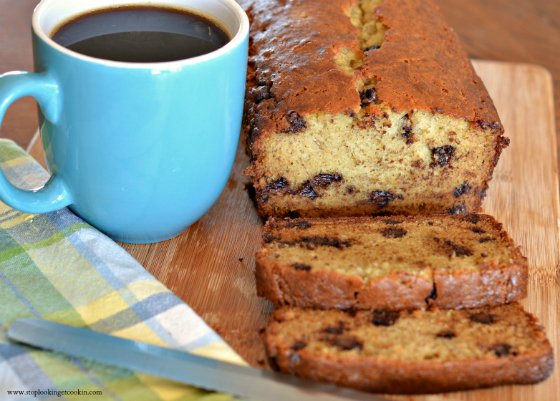 Chocolate Chip Banana Bread and a Blog Makeover » Stop Lookin'. Get Cookin'. 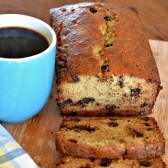 So kick back, enjoy your drink and a warm slice of banana bread. This recipe is one of my kids’ all-time favorites that my mom makes for them. It came from my Grandma Laures. They nag me ALL-OF-THE-TIME to make it for them and I tell them that grandma’s banana bread wouldn’t be nearly as special if I made it for them. They don’t buy that answer – AT ALL. But today I’m going to surprise them when they get home from school and have warm banana bread waiting for them. I can see my Mother-of-the-Year Award hanging on the wall already. And when I go to receive that award (Oh yes, I’m going to pick this one up myself. I’m not going to let this one get lost in the mail like ALL of the others.) I will just have to get a makeover myself. Hmmm, my hair will need a fresh color and I’ll certainly need a new dress. Now, just which shoes will I wear? 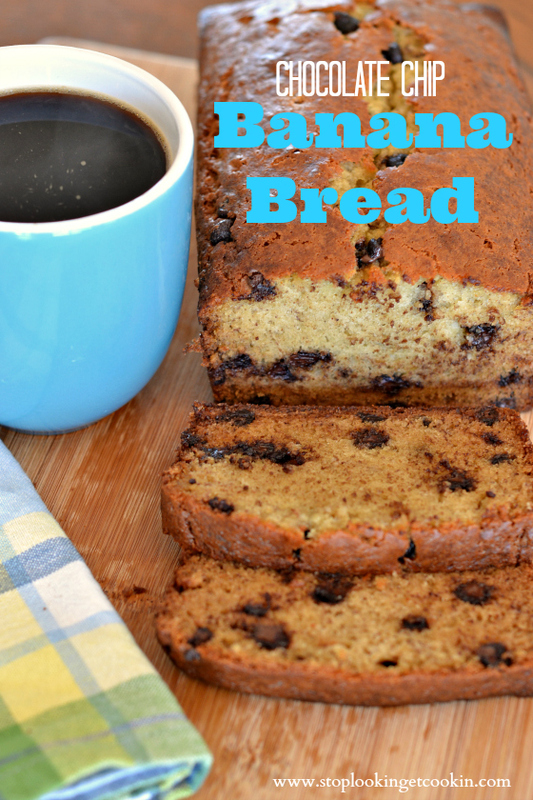 This recipe can easily be baked up ahead of time and then frozen once the bread is cool. You can add nuts if you like, about ¾ cup to this recipe. If you don’t want the chocolate chips, omit them. Mix in buttermilk, baking soda, salt, and flour. Lastly add the chocolate chips. Treat a loaf pan (9x5x3) with nonstick spray. Fill pan with batter (should be about 2/3 full). Bake for about 1 hour. Test to make sure the center is done. Depending on your oven, it may take up to another 10 minutes. Let cool on a rack for 10 minutes. Then release from pan. Serve warm with some butter on it if you like. Store in an airtight container. This is also a great item to freeze and pull out when you need it. LOVE the new look! It’s so fun to freshen things up. We should get together soon! Thanks Lindsay and yes, we should get together soon. I totally agree with Lindsay- it looks so fresh & clean looking. I’d totally eat a slice of that bread right now too! It looks great but I thought it looked great before. Why the change? Sometimes a girl just needs a new look. 🙂 I wanted a crisper, cleaner look. I loved the red background but I wanted a change. Although my 9 year old who loves colors doesn’t like this look as well as the other one.